Aerial view of Big Sand Cay. Photo by Kaieri Photography. The remote Big Sand Cay (also known as Great Sand Cay) is a spectacular uninhabited island, and part of the Turks Island archipelago in the Turks and Caicos. 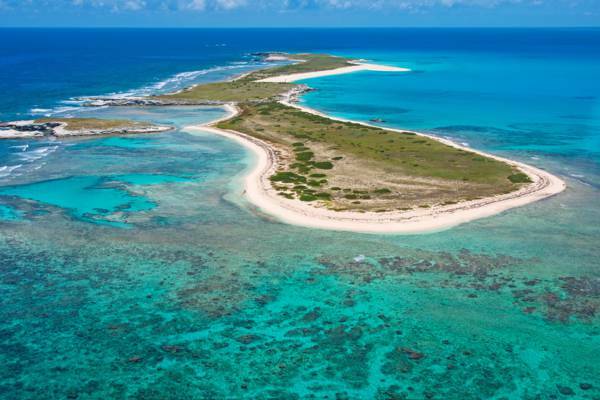 The cay is located 7 miles (11.4km) south of Salt Cay, and has a collective area of about 125 acres (51 hectares). Big Sand Cay is an exceptional location for birdwatching, especially for the tern and noddy. The island also attracts numbers of nurse sharks in the summer months. The western side of Big Sand Cay features one of the finest beaches in the Turks and Caicos. Due to it being located on the leeward side of the cay, there’s very little seaweed or flotsam, and the close proximity to the open ocean allows for breath-taking clear and blue ocean water. As the island is rather long, the lee side is quite sheltered and is a favoured mooring location for cruising yachts. The eastern coast of Big Sand Cay is irregular, with small coves, dune bluffs, and several rocks off the coast. During calm conditions, exquisite and varied snorkelling can be found off the east side of the island. Underwater visibility is excellent, and the coves and gullies, with interspersed sand beds, are fascinating. The terrain of Big Sand Cay is quite scenic. Like many of the windward coasts in the Turks and Caicos, the island features an environment of semi-lithified dune bluffs, which consist of soft limestone. These rolling hills support sea oats and salt resistant coast vegetation. Although largely unknown today, the Turks and Caicos saw quite a bit of activity during the glory days of treasure hunting in the 1970s and 1980s. With the advent of scuba diving and metal detection technology, professional treasure hunters were combing the Caribbean in search of wealth, often crossing the line into illegal practices. The best known examples was the infamous saga of the Molasses Reef wreck. This small caravel sailing ship was discovered in the mid-1970s by treasure hunters, who recognized that it likely predated the period of Spanish galleons and their shipping of gold and silver to Europe, and may have been Columbus’s Pinta. The Government sought to protect the invaluable historical site, but unfortunately unscrupulous wreckers blasted the site looking for anything of value. What remained of the wreck was later excavated in the 1980s by Texas A and M University, and artefacts can be seen today in the Turks and Caicos National Museum. It’s thought the vessel wrecked sometime between the years 1510 and 1515, placing it directly on the brink of the Age of Discovery. The origin of the ship largely remains a mystery. It’s believed to be the earliest European ship wreck excavated in the western hemisphere. Big Sand Cay also experienced a similar and unusual occurrence, and on two separate occasions, unknown tea sure seekers had obviously been excavating and searching on the cay, once in the 1850s, and again in the latter 1900s, when heavy equipment was found abandoned on the island. One of the more famous shipwrecks in the Turks and Caicos is also found near Big Sand Cay. The HMS Endymion was a British fifth-rate 44 gun warship that sunk in 1790 on what is now known as Endymion Reef, located 5 miles southwest of Big Sand Cay. The site is occasionally visited from Salt Cay as a dive site. Big Sand Cay is quite remote, and there are no organized tours to the island. To visit, it’s necessary to arrange a custom charter from either Salt Cay or Grand Turk. Salt Cay Divers has the most experience with the southern region of the Turks Islands. Last reviewed by an editor on 17 December 2018.